Today’s post is another in the series of Doing Business in Brazil 101 and focuses on Accounts Payables,or put another way, paying your bills. Not as much fun as Accounts Receivables, but it’s still important and has to get done. 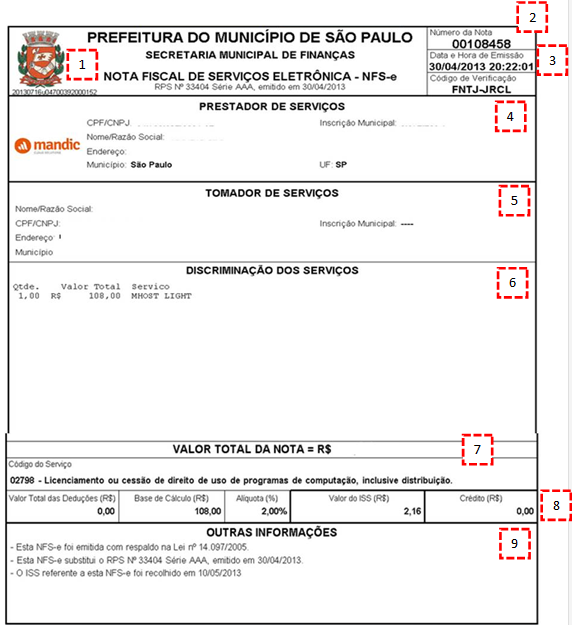 Accounts Payables (AP) is a foundation of business accounting, and Brazil has a unique system in place to pay your bills. Every month you will get a series of bills & invoices, and these payables can take a couple different forms and be paid a couple different ways. In this post, we will go through the most common forms of bills and how to set them up for payment. When I first moved to Brazil in 2008, I wish someone would have explained this to me, because at first it seemed like such a black box process with a maze of possibilities. I was used to getting my bills via mail or email, and a couple times per month I would sit down, write the checks, and mail them in. The boletobancario or just “boleto” is basically an electronic payment coupon generated by the merchant’s bank. You will typically receive via email or mail, and personally I prefer email. 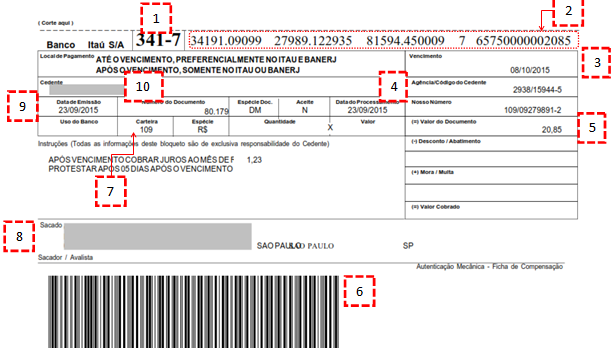 The Brazilian mail service isn’t always reliable, and if the vendor isn’t organized, you end up getting the boleto after it is already expired, which will force you to go through the process of getting a new one issued – a pain for both parties that usually required fees. Our dogs have also been known to snack on boletos if the mail guy is a bit ambitious and hammers it through the mail slot. When received, you can pay at your bank, the lottery house, some drug stores or most convenient of all, log into your bank account and pay electronically. Do yourself a favor and buy a bar code scanner so you don’t have to type in the bazillion numbers each month. Helps on so many levels to keep your sanity. 10.) Cedente: Name of the service provider (the Payee). When you log into you bank account, you will input the barcode into the system and the last digits of the barcode are the amount to be paid so the value should be filled automatically. Select the payment date and then pay. There are some checks built into the system so it crosses the due date, amounts etc… If there is an error, the system will let you know and you can correct prior to payment. When you buy a service or product you will also get a Nota Fiscal, this is a document generated by the Municipality where the service or product is rendered. The NFS-e is an official tax document and lists the nature of the transaction and the taxes due. This information is transmitted to the tax authorities. You may get a boletotogether with the NFS-e, or the bank account info may be on the NFS-e and you will be expected to make a wire transfer service provider. Corporate taxes in Brazil are basically paid in 2 ways: retained or withheld taxes (Retenções) and post sale. Retained taxes are subtracted from the gross amount due and are paid by the customer. So when you look at the NF-e, there will be the gross value (total value of goods and services) and the net value after retained taxes are paid or discounts applied. The post sales taxes are paid by the service or goods provider on a monthly and quarterly basis. The format for the NF-e for goods or products is similar to the NFS-e for services, but there are additional features that are included. 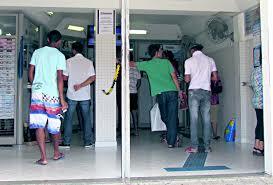 A product cannot be transported in Brazil without the NF-e and the DANFE – DocumentoAuxiliar da Nota Fiscal Eletrônica. 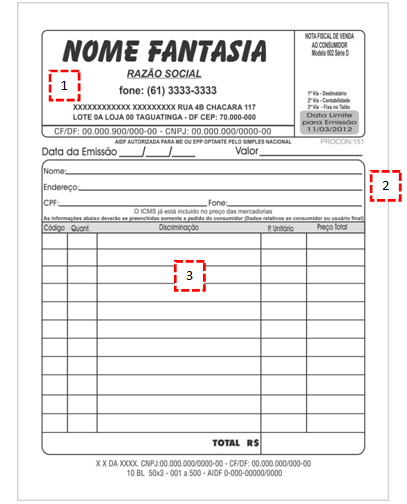 Brazilian Business Accounting –Nota Simples. A Nota Simples is basically like a paper receipt and is usually not an official tax document, although there are some companies that still use paper receipts and then submit those to tax authorities. Many small companies and stores will issue this type of receipt and will not issue or report the revenue to the tax authorities. These are typically filled in by hand at the point of service and paid in full on the sale. Cash is king you might say. 3.) Description of service or good. 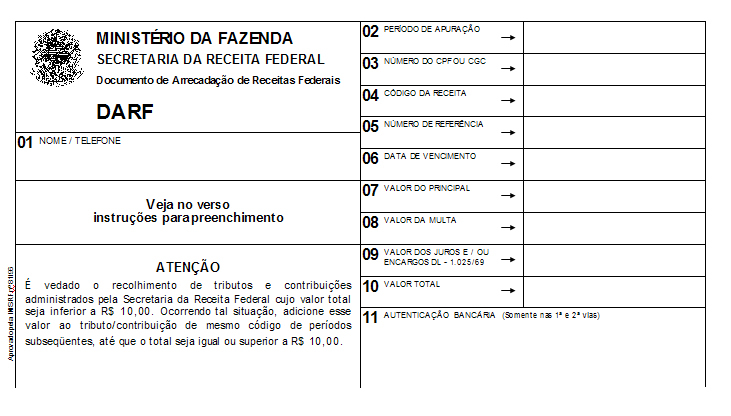 Documento de Arrecadação de ReceitasFederais (DARFS) is the taxation document used to pay federal taxes and contributions in Brazil. Federal taxes are typically paid monthly and quarterly. The DARFs are usually generated electronically and there are 11 fields to fill out. 11.) Authentication code issued by collecting institution. Still awake?Tough slogging I know. A couple closing thoughts to keep in mind. First remember to keep all your Payables documentation for inclusion in the annual accounting. It’s important from an accounting standpoint if your company is using the Presumed Profit tax regime, but it’s absolutely essential if your company uses the Real Profit tax regime. Second, make sure that your company’s information is always complete and correct on the documents. Never assume that the other guys have it right, because many times you get a nasty surprise at the end of the year. Third never assume that the other company is paying the retained taxes correctly. Always reconcile and make sure it’s correct so there aren’t any values left outstanding from one year to the next. Finally, the tendency is to go all electronic, so take the time and make the investment early. It’s not glamourous, but it’s important information to get a handle on if you want to do business in Brazil and have success. We will go through Brazilian taxes in more detail in a future article and walk through how that impacts doing business in Brazil.